Is Apple Music Spotify’s Largest Rival? Social media has become a prominent force for connecting people across the world. Marketers are catching onto this trend and now use these networks to advance their company’s goals. Here are the three aspects indicating why social media is here to stay. In the last five years, consumers and marketers have both increased their use of social networks. Companies recognize how valuable social media can be in promoting their brand, gaining attention, and improving sales. 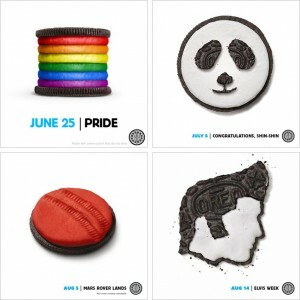 Oreo cookie made a splash with their "daily twist" campaign. [caption id="attachment_8620" align="aligncenter" width="300" class=" "] Image via Adweek.com[/caption] Canadian paint company CIL found their paint names weren't appealing to men so they created an app for renaming colors. Psychology is now backing the effectiveness of social media use; studies have highlighted its impact on consumers. One study from the University of California San Diego found that emotions carry over social networks. They tracked over 1 billion posts over a 2 year period, especially on rainy days when the posts were more negative. They found that these emotions were transferred to friends posts who lived in other cities or even in other parts of the country. This is a vital study for marketers because it demonstrates how the tone of a social media post can trickle down, so it is important to keep posts upbeat and positive. Social Media is captivating the world’s attention and we are almost completely immersed in its web. Companies now recognize it as a crucial feature in their overall strategy. These social networks allow for a continuous dialogue which lets us to connect like never before. Social Media is the new standard, and it won’t be going away anytime soon. Drop us a line if your business is ready to improve its outreach and visibility.